The obstructive sleep apnea syndrome (OSAS) is characterized by upper airway obstruction leading to hypoventilation, apnea and sleep fragmentation. A patient being evaluated for OSA should be assessed for surgically correctable causes of OSA. Patients without the typical risk factors, such as obesity, should raise a clinical suspicion of abnormal anatomy as a cause of OSA. If a young, athletic male is experiencing excessive daytime somnolence with loud snoring at night, it is important to assess the patient\’s airway because of potential implications of treatment. In anesthesiology, the Mallampati score, also Mallampati classification is used to predict the ease of intubation. A high Mallampati score (class 4) is associated with more difficult intubation as well as a higher incidence of sleep apnea. The goal is to assess whether the upper airways may be seen easily during tracheal intubation. The higher the score, the higher the risk of a difficult intubation. The link with a physical examination of OSAS patients is simple, as a high MS could be associated with a higher probability of sleep-disordered breathing (SDB), because the oral airway is smaller. Mallampati test: The Mallampati classification correlates tongue size to pharyngeal size. This test is performed with the patient in the sitting position, head in a neutral position, the mouth wide open and the tongue protruding to its maximum. Patient should not be actively encouraged to phonate as it can result in contraction and elevation of the soft palate leading to a spurious picture. 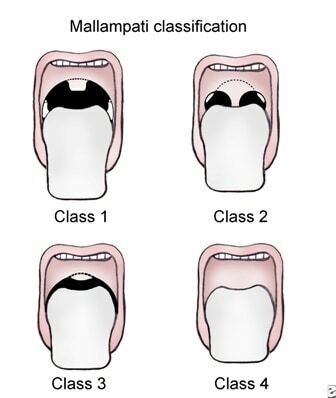 Classification is assigned according to the extent the base of tongue is able to mask the visibility of pharyngeal structures into three classes. In my experience over a period of 15 years doing OSA surgery, the Mallampati Test is not very helpful for the surgeon, but it may help the anesthetist to anticipate intubation problems. 1-Felxible fibre optic endoscopy of the upper airway for functional assessment and diagnosis of a pathology in nasopharynx, supraglottic, glottic and subglottic areas.